Another week of whisky down and we are 5 drams away from Malt Mission #200. Crazy. Exciting. Dangerous? Looking forward. Thanks for reading. Clynelish. (Calvin) KLEIN - (dog) LEASH. Depending my mood this distillery is often my answer to the unavoidable question, "What is your favourite whisky?" If in a less decisive mood I might say, "Distilleries north of Inverness: Glenmorangie, Dalmore, Balblair, Pulteney, Clynelish and Brora, etc." And if I am being difficult I will answer, "What day is it today?" Built in 1819 and suffering a stop-start syndrome many distilleries underwent due to financial constraints, in 1931 the economic recession forced Clynelish to close. Production restarted in September 1938, only to shut down from May 1941 until November 1945 because of restrictions on the supply of barley to distillers during the Second World War. In the 1960's Clynelish was modernised when electricity was installed and stills which had been direct-heated by coal furnaces were converted to internal steam coil heating. Clynelish was replaced by a new distillery built on an adjacent site in 1967-68. The six stills in the new distillery were run on the most up to date lines, while retaining the traditional still and the original water source (the Clynemilton Burn) ensured that the quality of Clynelish whisky remained unchanged. The "old-Clynelish" was renamed Brora when it began producing a peated style in 1969 to provide that character profile to Johnnie Walker blends. It was finally closed in 1983 and is much sought after by (wealthy) whisky lovers. Believe me, I would participate if I could... the stuff was DE-LI-CIOUS. At £85-£200 a pop, I will have to choose a roof over my head instead. 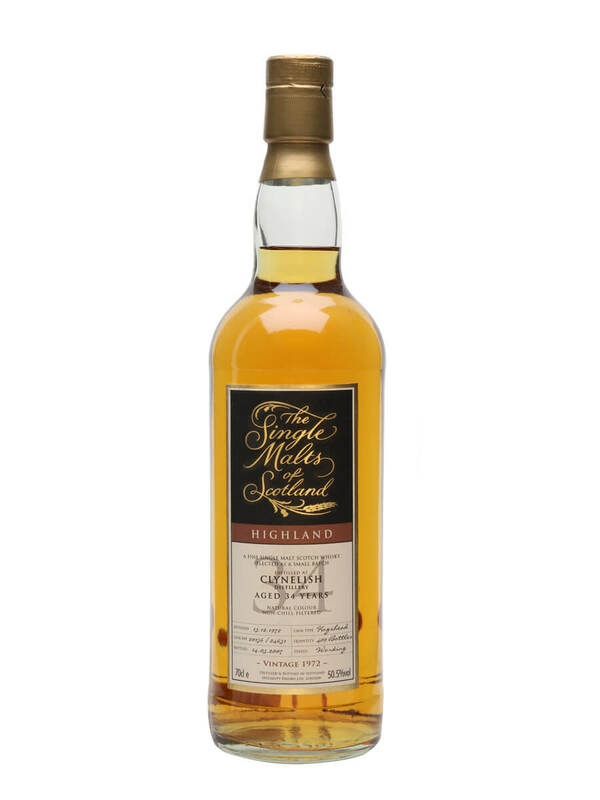 This is another release from the Single Malts of Scotland who were awarded with a few medals in this month's Independent Bottlers Challenge in Whisky Magazine. This is one of 409 bottles from a small batch vatting of two "complimentary casks". For all Single Malts of Scotland tasted on the mission click HERE, and for more info and/or other Clynelish tasted on the mission click HERE. I cannot hold back my delight, old (any?) Clynelish gets my heart racing. Apples, peaches, apricots, vanilla, and smoked paprika. Creamy features so common in Clynelish: marshmallows, Cool Whip, etc. Aromas of baked goods, more fruits, spice, and smoke. As objective as I tried to be, I think my feelings were made clear above. Perfect abv% for drinking, absolutely luscious flavours delivered in a slightly edgy style, honeyed and spiced and very Clynelish. Someone please put this on my Christmas wish list?